Andrea Zittel’s Wallsprawl #4 (Las Vegas, Next to Nellis Air Force Base), is based on an aerial photograph of the southern Nevada military installation known as Nellis Air Force Base. Zittel sourced the image online from an aerial image database (before Google Maps made such imagery easily accessible). 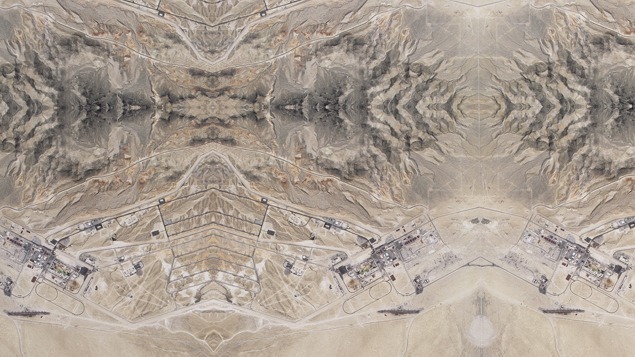 The original image—before Zittel repeated and replicated it—shows a large-scale military campus intersecting with the wide-open desert landscape, exposing the infrastructure of a site that is presumably off-limits to the general public. By converting an image of an American military base into custom-designed wallpaper, Zittel metaphorically transforms a highly-charged landscape into pure aesthetic decoration and encourages a different way of viewing and thinking about the world. Andrea Zittel, Wall Sprawl #4 (Las Vegas, Next to Nellis Air Force Base), 2011, dimensions determined upon installation. Collection of the Nevada Museum of Art, Museum purchase with funds provided by the Contemporary Art Acquisition Fund.